Today a Nation mourns the loss of our Nobel prize-winning poet, Seamus Heaney. A generous, unpretentious, uplifting man whose legacy will live on. I am very fond of this post from Social Bridge in which he features so beautifully, a beautiful tribute to a celebrated Irishman. Mourned not only in Ireland, but in the world. Seamus Heaney and his poetry have been weaving in and out of my life for over 25 years now. I remember celebrating wildly with my mother in 1995 when news came through that he had won the Nobel Prize for Literature. It seemed so right that he was star poet reading at the Kilkenny Arts Festival in 2009, just a few short weeks after Mother had died. Kilkenny was the place where my parents first met in the early 1940s and I felt their happy youthful presence all round me as I made my way to St. Canice’s Cathedral for the performance. Where were YOU when you first heard ‘I have a dream’? In August 1963, when I was 15 years of age, I was running to do something in the kitchen. (We tended to run in those days instead of walking!) Passing by the open living room door where my father was watching the news on television, I was stopped dead in my tracks by the rousing words ‘I.. HAVE… A DREAM ‘.I was aware that there were ongoing civil rights issues in the USA at that time, and the name Martin Luther King was familiar. I had not however ever heard him speak before and I was riveted to the spot. This was Martin Luther King, the voice of Black America, delivering a speech in which the spoken word became a servant of his cause. It was beamed across the world and affected the lives on many of the millions who watched, including myself, a teenager in County Donegal, Ireland. Moneygall is a pretty little village carefully looked after by the residents – every house had window boxes and flowers in full bloom when I passed through on Sunday on my last stop for ‘Heritage Week. 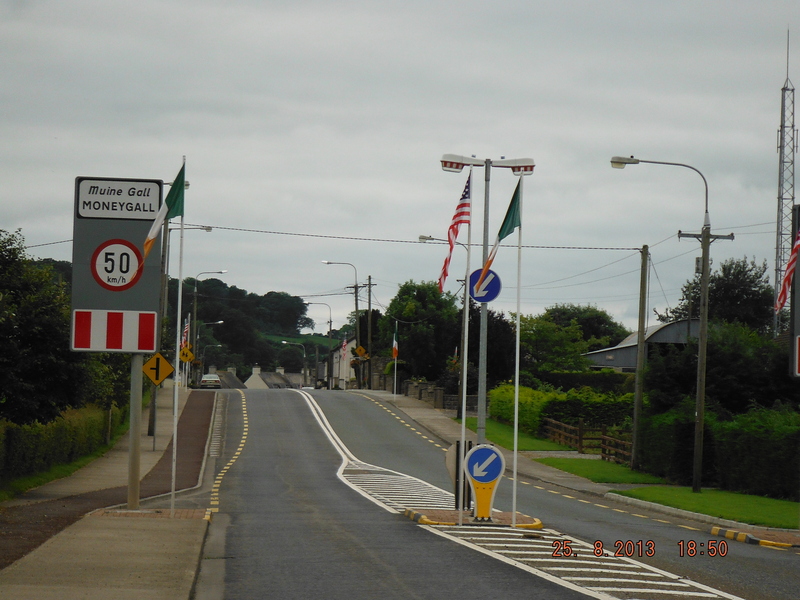 A few short years ago, thousands of vehicles passed through this little village every day as it is situated on the busy main Limerick to Dublin road. The village is now bypassed,allowing the villagers to reclaim their special place. Here you can stop and relax and enjoy a cup of coffee and catch up on the link with Barack Obama. Papillion, the winner of the Aintree Grand National in 2000, was bred in this area, and was the most famous Moneygall personality before Barack Obama! When Obama addressed the crowds in Dublin earlier in the visit,he used the Irish translation from his famous ‘Yes, we can! , which translates to ‘Is feidir linn’. This can be seen on the flower tubs in the village. Well done, Moneygall! Is feidir linn! I have been given a Sunshine Flower by Jean Tubridy, for which I am most grateful and surprised! I do not normally take part in these blog ‘awards’, as they are so time consuming but have made an exception here to mark a beautiful sun-filled summer of 2013 and to acknowledge the wonderful bloggers that I follow and who follow my scribbles here on the internet. I am doing so as a once-off celebration of you all! Link back to your nominator. I have followed Jean Tubridy’s blog almost from the get-go. Such a wonderful writer with a beautiful command of English who is able to get to the heart of the matter in a half sentence. Inspirational, funny, delightful. 1. I love the sun and first thing every morning I look to see if the golden rays are dancing on the tree outside my bedroom window. 3. I love flowers – wild and in the garden – and spend hours peering at them. 4. I love scenery and am blessed to live in Ireland that has such wonderful scenery. 5. I love books and good writing and read in the hope that some of the writing eloquence might be transmitted to me! 6. I love music, especially the big emotional kind, such as Renee Fleming singing Song to the Moon. 7. I love the Moon and the Stars and am blessed with my own piece of sky here in the country and have a telescope to enjoy them all the more! 8.I love meeting with friends for coffee or to go to theatre or just for a chat as they lighten my days! 9. I love solitary walks in the company of birds and insects and hearing the sounds of nature. 10. I love the internet and blogging- it has enlightened me more than anything else in my life and opened up a whole new world to me in the ‘golden’ years of life. So who will receive my Sunflower? If YOU are reading this, then please accept one from me ! I read so, so many wonderful posts each week,I cannot single out a few as each is a gem, a jewel, a ray of sunshine in my life. Each is thoughtfully written and ‘put out there’ to inform, to inspire, to provoke, to gladden, to dismay, to enlighten, to bring Sunshine to our lives! Thank you all! 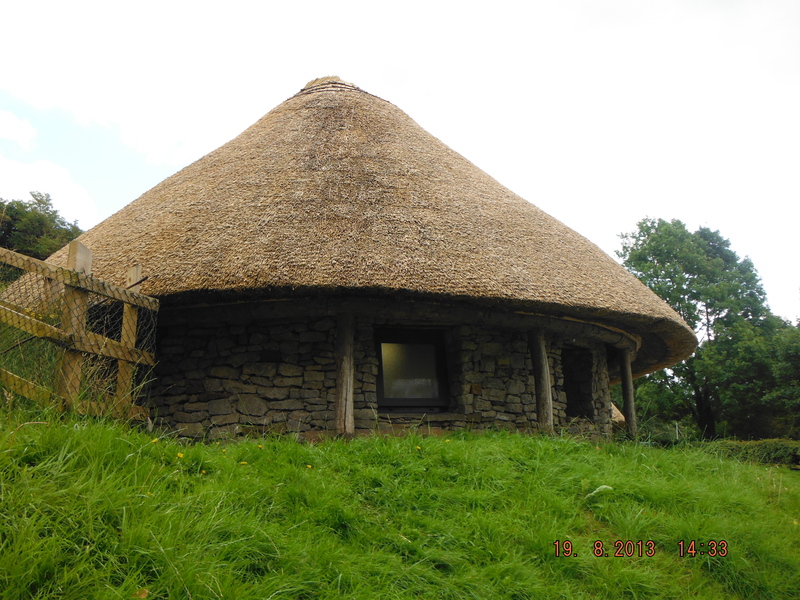 Mythology, ancient settlements, magic, folklore – Lough Gur has them all! Almost in my backyard – about 40 minutes drive – Lough Gur is one of the most important archaeological places in Ireland, yet I had not been there in decades. On the list of special events for Heritage Week was a complimentary guided tour of the sites surrounding the lake, so what better to do on a fine Monday morning than to go and find out about this historic place? Our first stop was at the Grange Stone Circle, – a perfect circle made of 113 standing stones and aligned to the rising sun on the summer solstice. Unfortunately it was not possible to get a single shot of the entire circle which has a diameter of some 150 feet. The circular shape is explained by the archaeological discovery of a post hole in the centre, from which the perfect circle was drawn. It is one of the most impressive stone circles in Ireland. In an adjacent field there are remains of another stone circle, but the main one is quite stunning and intriguing. Rose, our volunteer guide, tells us that locals will not enter this area after dark, although she did not say why they are fearful. Archaeologists have found some human bone fragments, and thousands of pottery shards. This has enabled them to date the structure to about 1800 B.C. The purpose of the circle is not known but it is probably ritualistic. One particularly large stone, weighing 40 tons stands 13 feet high. It is called the Rannach Croim Duibh, named for the Celtic God, Crom Dubh, the Black Crooked One. It is said to give energy to those who rest their foreheads and the palms of their hands on it. Our next stop was at the ‘New Church’ which in spite of its name is in ruins. It is said that Tomas OConnellan a minstrel bard, who died about 1698 is buried here in the adjoining graveyard. The church is on the shore of the lake. 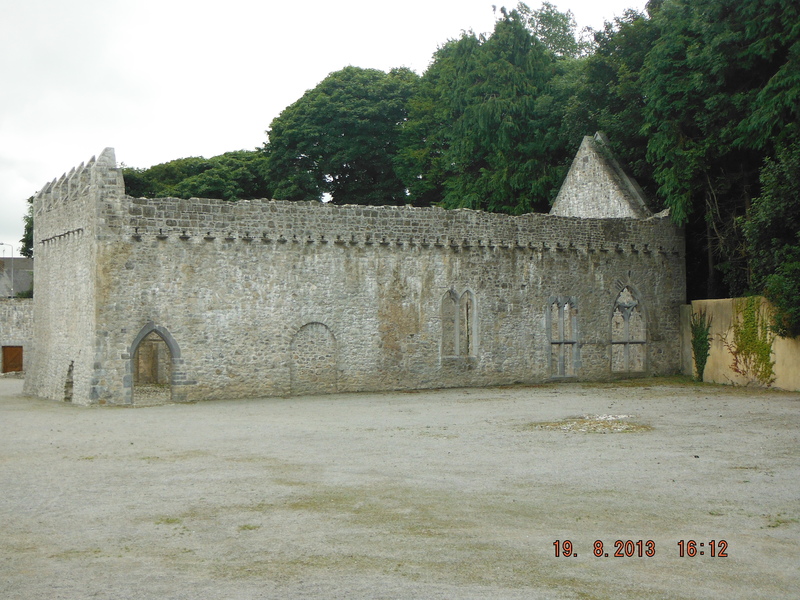 Scenically located by the shore of the Lough, at one time the church was used by the Earl of Desmond. The bored teenager (unrelated to the writer) dates from the late 20th or early 21st century and sits on a wall which was built some 4 centuries before her arrival. There are a couple of tombs inside the walls of the church as well as some graves in the churchyard. Our next stop was the Giant’s Grave which is in fact the remains of a wedge tomb that lies on the slope of a hill, just a short walk from the New Church. This tomb is about 4,000 years old and when excavated was found to contain the remains of at least 8 adults and 4 children with further human remains discovered outside. The story is told of how an old woman lived in this tomb for several years at the time of the Famine. When she died the farmer who owned the land reputedly demolished the tomb to prevent anyone else using it as a shelter. We processed (in our cars) in a funerial fashion, around the narrow twisting roads to Carraig Aille (Rocks on a cliff?) A stiff uphill walk with uneven ground (from where a lady had to be airlifted last year, having broken her ankle on the ascent) lead to the remains of two stone forts. (It was at this point that I regretted not testing the energy giving properties of the large stone at the Stone Circle). These circular enclosures would have been domestic in nature. Archaeological excavations revealed bronze and iron pins, metal implements, combs, jewellery and beads of amber and glass and date the site at about one thousand years ago. There is a spectacular view of the Lough from up here, with a marshy reed filled area far below. This indicates the original level of the lake, for as part of the Poor Law Relief Schemes, the Lough was drained in Famine times by means of channels, resulting in the level being lowered by 8 feet. It is said that there were dozens of artefacts discovered at this time, but that they were carted away and dumped! Strange stories of hidden treasure protected by the remains of a sacrificed servant, yet to be discovered, abound in this place! And so we arrive back at Lough level and get our first view of remains of lake-dwellings that date back to about 500 A.D. These dwellings, known as Crannógs, were created by laying a circle of boulders in the water, filling in the enclosure with earth , and then a hut type structure was raised on top. In the image above, the Crannóg was located on the site of the vegetation behind and to the right of the swans and dates from about 500A.D. The design of the interpretive centre is based on what these lake-dwellings would have looked like – stone dwellings with straw roof and timber supports. There are numerous other sites around Lough Gur that span thousands of years of civilization. Another climb, again without the much needed assistance of energy from Crom Dubh, leads us to Hangman’s Rock from where there is a great view of the loch. The Interpretive Centre is so worth a visit, for a small admission fee. There are replicas of some of the major artefacts associated with this area, audio presentations of some of the folklore and mythology associated with the Lough, costumes for children to dress up in, an area where they can become archaeologists and discover treasures! 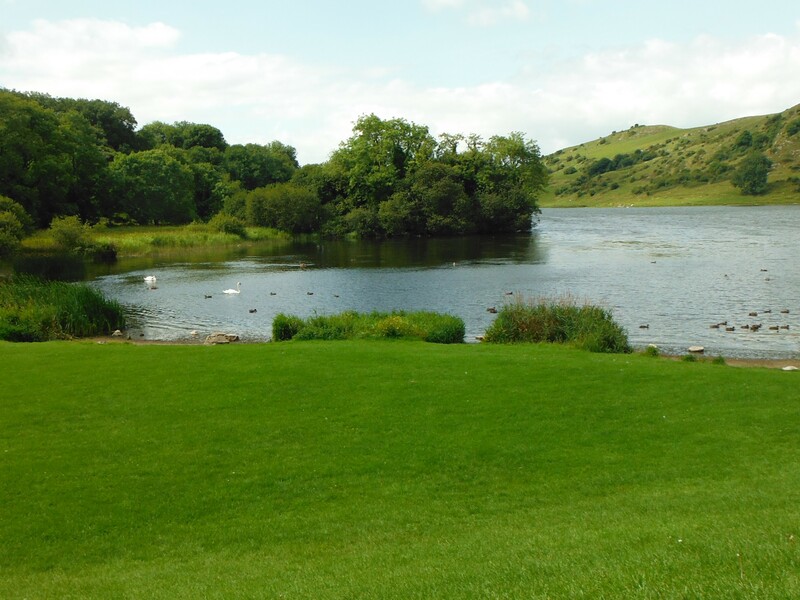 Lough Gur is a beautifully scenic place with delightful walks along the Lough. The feeling of tranquillity and serenity is palpable, all the more amazing when you realize that this is only 15 minutes away from Limerick City – well worth a visit, and an ideal destination for our visitors from overseas. 5,000 years of habitation just waiting to be explored! 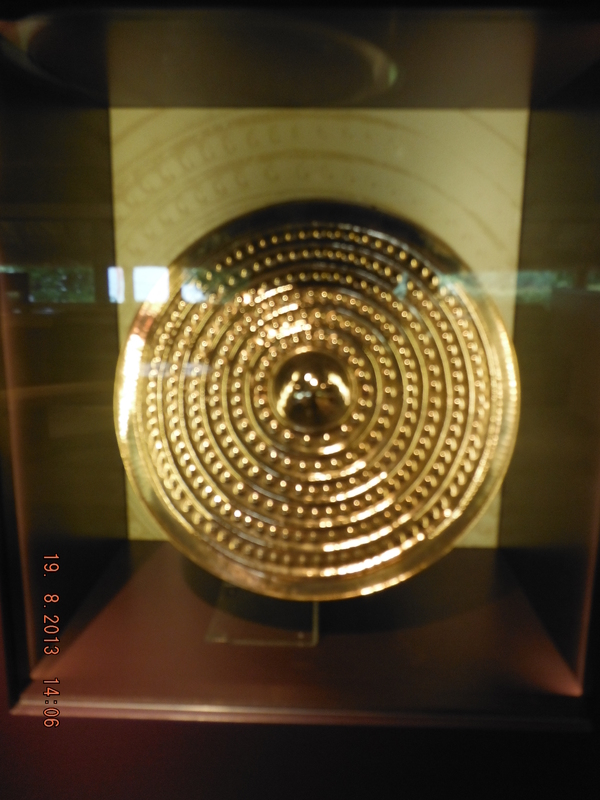 This is a replica of the stunning bronze Lough Gur Shield – the original is in the National Museum of Ireland. My thanks to Kate at the Heritage Centre for her warm welcome and for sharing her knowledge. A warm welcome is guaranteed to this jewel in our heritage crown! In Ireland we have an expression, ‘Soft day, thank God’. It’s more of a greeting than anything else, and is totally baffling to anyone who is not from these parts. Living as I do in Munster, in the southern part of Ireland, this is a common expression with which I have become familiar. However my origins are in the north of the country, where the expression is not common. ‘Soft day, thank God’ will be heard only on wet days as it is an acknowledgement of persistent gentle rain, such as we had today. I recall my father hearing this expression for the first time when he first visited this part of Ireland. I could only describe his response as bewildered indignity. When the expression was explained to him he responded ‘What are you talking about? It’s a miserable wet day!’ Which of course it is! There is however a beautiful by-product in the form of gentle raindrops resting on plants, and I attempted to capture some of these jewels in my garden this evening. Photos are here. The magnificent restored structure of the Desmond Banqueting Hall dominates The Square in my local town, Newcastle West, Co Limerick. I went behind the façade this week and discovered some hidden treasure! 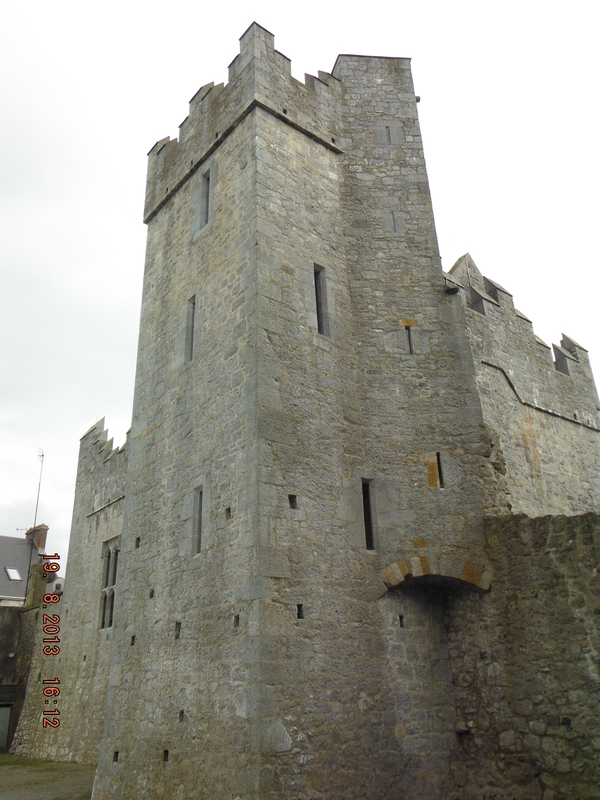 There seems to have been a castle in this location since the 11th or 12th century. 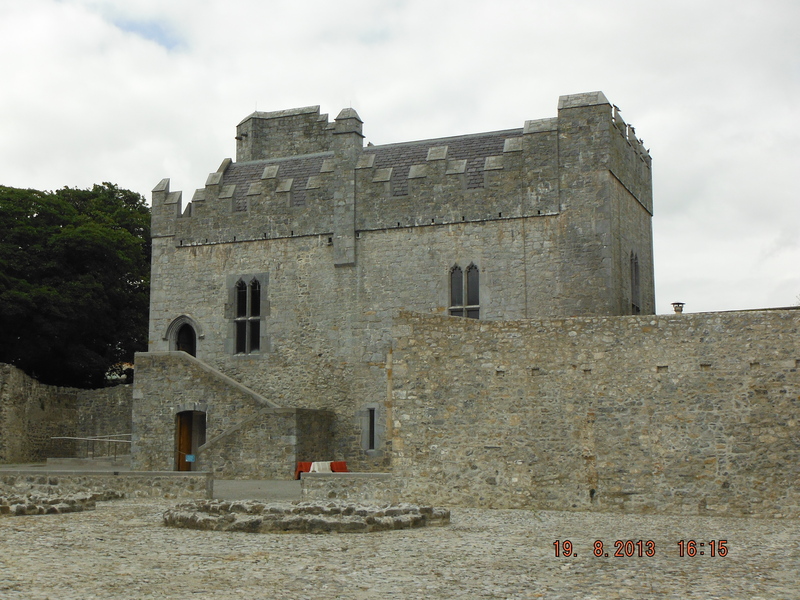 The restored buildings are 15th century and are the only surviving components of what was an extensive castle complex. 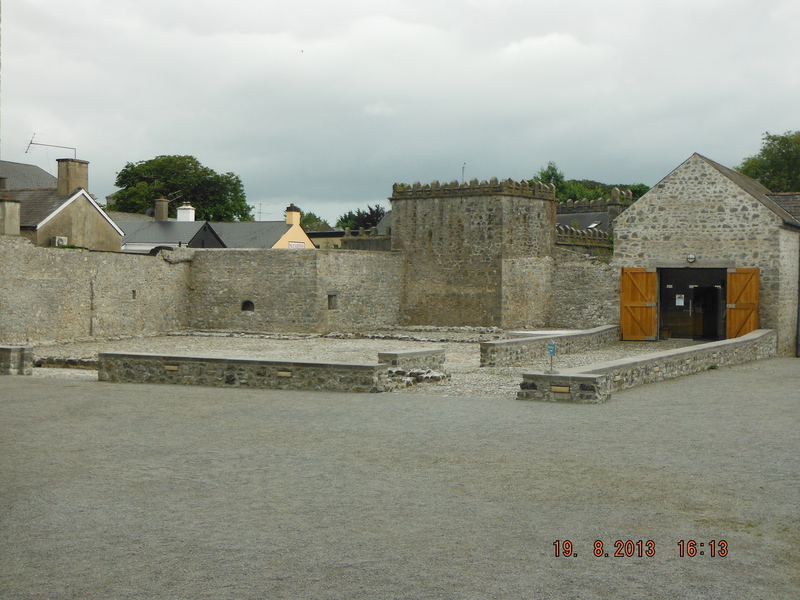 The Halla Mór (The Big Hall).When we first came to this area over 30 years ago, there was a timber merchants yard in front of this beautiful building. At one time, according to the very knowledgeable guide, the local cinema was located in this building. It is never too late to rediscover our heritage! 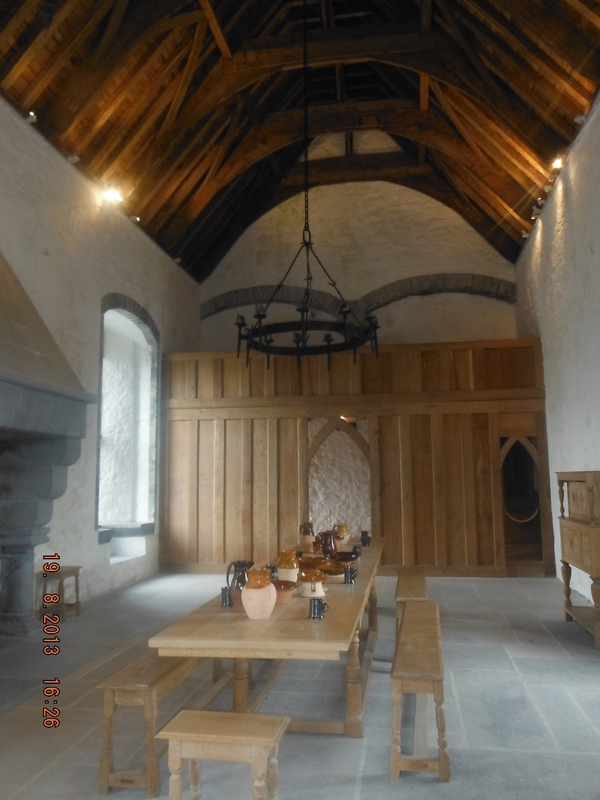 The restored banqueting Hall is now on two levels and is used for local functions. This is the rear view. The top floor is used for recitals, lectures and for cultural events . If passing near Newcastle West, do drop in – admission is free and the guide is a mine of information!